The math plugin uses MathJax (default) or KaTeX to render maths. You can render inline math by wrapping with a single $ like so: $E=mc^2$. Discourse math uses a heuristic to ensure that sentences such as: “I spent 20$ and another 100$” do not get converted. This plugin only works with the latest version of Discourse with experimental markdown it enabled. This plugin is disabled by default, after installing be sure to enable it via site settings. We would love to support server-side rendering, there is already an online sample. What about the old plugin? It only loads the math renderer if it detects equations on the page. It surgically applies renderer as opposed to performing full page scans. Bordering syntax for inline & block math is acceptable. The only unclear thing is syntax switch. 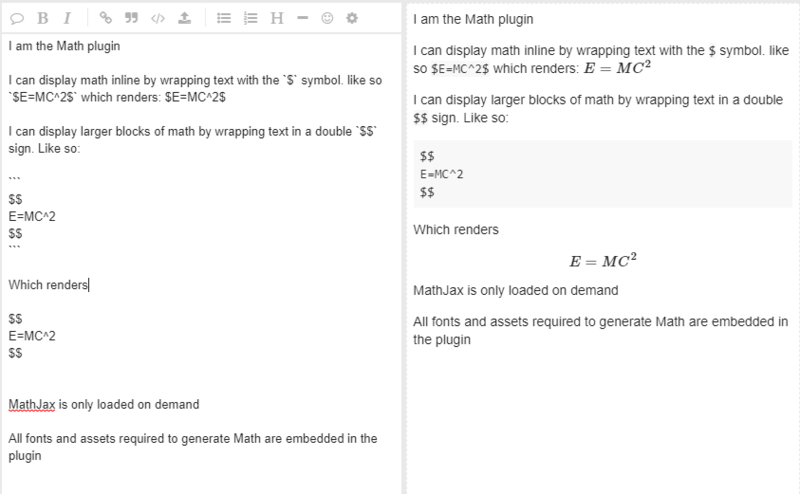 Then i’ll be able to create “official” math plugin for markdown-it. In worst case, i’ll schedule plugin without (3) after some deadline. Sort of, MathJax weighs 80K and then you need a few fonts. It adds up to about 130K or so. Hmm… I’m not sure where you’re getting those numbers. When I download and expand your repository, I get a 20MB folder on my hard drive - 19.9MB of which is MathJax. Of course, you’re absolutely right that the core is quite manageable; it’s the ginormous number of little font files that take up all that room. While a single MathJax interaction uses only a fraction of these, it might still result in quite a few callbacks to the server which I’d prefer a CDN to handle. I’d also mention one problem with server-side rendering, namely you lose some interactivity with the equations. In particular, you lose the Accessibility Features Extension. This is a big deal for those working in an academic setting where the Americans with Disabilities Act requires that course content be delivered in as accessible a format as possible. Hmm… I’m not sure where you’re getting those numbers. From webpage test http://www.webpagetest.org/ running on a page on math.stackexchange that includes equations. Well yeah, also the repo includes fallback fonts a gigantic amount of rendering options and so on and so on. which I’d prefer a CDN to handle. Or do a simple PR to add a site setting to this plugin, I will probably get around to it. That is a good point, when we do eventually add server side rendering we will make it options. Which is a garish webpage about a LaTeX syntax to PNG converter intended to run as a CGI, but also runnable as a command line tool. It’s been around a long time, long enough to iron out bugs, and is written in C for speed. Heuristics can be helpful, but when they are wrong then what do you do? I had created an Issue on github for this, but the Issue Tracker seems to have disappeared. “Same line math”, that is, things like $a+b$ using single $, do not display at all when inside a “spoiler” tag (The “hide details” thing). I have just updated to the most recent version of both discourse and discourse-math (1.9.0.beta15 and 0.9 , respectively) and this bug seems to always occur, no special configuration to reproduce, just put some latex within a “spoiler tag”. I emphasize, such a thing only happens inside these “hide details” elements. Outside of them, within a typical reply, latex shows perfectly both with $ and with $$. We need to discuss a syntax for asciimath. Once a syntax is picked support will be very easy to add. I searched for posts that discusses the Asciimath syntax and didn’t see any. Suggest a combination of what is available today and a backtick to maintain some consistency with MathJax. I’ve just submitted a pull request to modify the plugin so that it can process input expressed in asciimath, as well as LaTeX. The code is on GitHub and (for a brief time only) you can see it in action on this temporary discourse instance. I chose to delimit asciimath input with a single percent sign (%). The aciimath webpage indicates a preference for a backtick (`); that seems a poor choice because markdown typically uses this to denote inline code. There’s not a whole lot of other choices of single character delimiters that aren’t either very commonly used in math (like +/-/=) or captured by discourse for some special purpose (like @ or #). I went with the percent sign, in part, because it’s right next to the dollar sign used for TeX. Note that you can still use a percent sign in math input by escaping it with a backslash. Hmm what if we did something like %` some math ` , I know it is 2 keys but it would save us from escaping percents and we could have a block form with % triple backtick? What do other markdown implementations do like math stack exchange etc? One thing that I like about the code the way I’ve set it up now is that it uses your original inlineMath function almost verbatim. I’ve just added a third argument to specify the delimiter - 36 for $ for LaTeX and 37 for % for asciimath. I rather like that simplicity and multi-purposing of code. Also, I’m a bit of a novice at this and not sure how much time it would take me to figure out to scan two symbols. I’m definitely open to using some other single symbol; I’m just not sure of a better choice. It would not be hard to set up a block form (I’d prefer to delimit it with %%) which would be passed to a div rather than a span. The typesetting itself, though, would be unaffected because asciimath itself does not distinguish between inline and display math. That’s why I didn’t specify a block form to begin with and I’m still not totally sure if it’s a good idea. I don’t believe that math.stackexchange uses asciimath and I’m fairly active there. I honestly don’t know just how widely used it is. My own interest arises because I use Discourse to set up fora for college students and I’d like something that’s a bit more intuitive for them to use. I think the fact that asciimath is, to some degree, a “simpler” LaTeX supports the idea to use a single delimiter as well. I can definitely do that! It looks like the math formulas aren’t rendered in polls. They render in the preview of the polls, but not when the polls are actually posted. Is this something that can be fixed? I wonder how dificult it would be to add KaTeX and whether smoebody is considering this. It seems that their code is maturing fast. It would have an added benefit in our case to have the same rendering as Khan Academy on the forum about Khan Academy translations. There’s no error handling, and the font size doesn’t quite match the client-side version, but it seems to basically work in my development environment. I really like the idea of this, should help performance quite a bit in some cases and starts unlocking email support! We still need to convert svg to png at some point for email. Because plugin development is currently way above my league, I just wanted to try adding KaTex via custom theme, using the autorender Katex extension. It kinda worked, but I ran into an issue with supporting a single $ sign as a math delimiter. It seems that even though I turned off the MathJax math plugin, the text enclosed in $ $ is converted to text inside <span class=math> and the dollar signs dissappear. Weirdly, I cannot reproduce this on META. Any ideas? Yeah the auto render stuff if very likely going to be extremely janky on Discourse. We rely on proper hooks that “decorate” chunks of HTML as they are being added to the DOM. We got to do this thing properly. Maybe @misaka4e21 can have a look at making KaTeX optional default off in the math plugin?